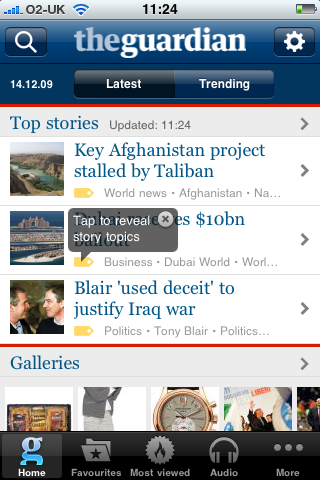 Having introduced a new mobile website earlier this year, The Guardian’s iPhone app was released today. While the mobile website provides a very good user experience, there is simply more you can do on an app, such as the option to read articles offline, which is a major bonus. As The Guardian’s Jonathan Moore explains here, a simple look at the visitor stats for the mobile site shows the market for an app. The iPhone accounts for the majority of mobile traffic, and the mobile site gets close to 1m monthly uniques. The user interface is smooth and the app is easy to navigate. At the bottom, you can switch between homepage, favourites, most viewed, and audio content, or you can navigate by section under the ‘more’ link. While other newspaper apps have limited the range of content accessible from mobiles, you seem to be able to access most of what is on the desktop website, though you can’t access much in the way of older articles. For instance, if I search for columns by Charlie Brooker, I can only go back as far as November. Articles are well laid out and easy to read. Text can be resized if necessary, though one improvement would be the ability to turn the phone for an article reader, as on the FT.com app. This is one of the most useful features of the app, and great news for people who want to read articles on the tube, or anywhere else with no 3G connection. There are a few things which could be improved on the app though; there are no hyperlinks within articles for instance, which, as The Guardian points out, is to keep users within the app rather than sending them to the phone’s Safari browser. A few people also seem to have experienced one or two problems with being kicked out of the app, though I have managed to use it for a few hours without any such problems. The ability to both read and add comments from the app would also be a huge improvement and this, along with the complaints from app-less non-iPhone users. seem to be one of the major suggestions from the users commenting on the app. According to Jonathon Moore, while The Guardian is not the first newspaper to develop an iPhone app, it aims to be the best so far, and it comes close to this. The app is definitely an improvement on an already very good mobile site, and I’m happy to pay the cost of the app for the offline reading function alone. I think the FT.com iPhone app is the best example of a UK Newspaper producing an iPhone to now, but the content on The Guardian has broader appeal, and this is the app I’ll be using more often. While online retailers are generally improving when it comes to usability there are still plenty of areas for improvement. Retailers such as Asda, Debenhams and M&S have made some good improvements to their sites, while sites such as Kiddicare and The Book Depository offer excellent examples, though some, such as Woolworths and Whistles, could do a lot better. Here’s a selection of the e-commerce site reviews we’ve done on the Econsultancy blog this year.. I have TV and broadband through Virgin Media, and both went down at about 6PM last night, and remained down for the next three and a half hours, though some customers are still without service this morning. past two years, and I have no major issues with the service in general, but in this instance the communication to customers, both online and offline, has been woeful.